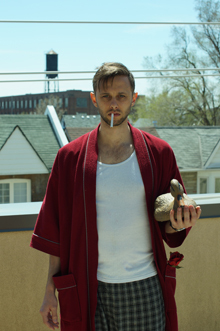 I realized not long after deciding to add Moose + Moa’s Art of Being Alone to my itinerary for this year’s Toronto Fringe Festival, that I’ve seen this one-man show before with another Mooney contributor. Feeling much like I was about to reconnect and commiserate with an old friend, I entered this show expecting a good time. The Art of Being Alone is about Stephane (Stephane Garneau-Monten) who is quite a sad, miserable sod on a downward spiral of isolation after being dumped. Face it, Stephane, she’s just not that into you. Sure he has friends but they’re of no help, they just tell him to ‘get over it’. Gradually, Stephane shut himself in to wallow in booze, smokes, and fantasies involving Keira Knightley. Accompanying him in his misery are, of course, the voices in his head, the ones provided by doubt, misery, and on the other hand, whatever shreds of confidence he has left. Considering Monten also wrote this piece about his own struggles, it clearly shows the process of catharsis that this journey took him through, anchoring his self-deprecating humor in reality. The show is very funny because it is real for everyone. We’ve all been dumped, we’ve all wallowed in depression and experienced the strong desire to lose ourselves in our own vices. Monten took his own experiences and made it into a show, one that we can all laugh at with him. In the show, Monten runs the gamut of depression — the rise and falls, good days and bad. On a good day Stephane went outside to get a coffee and locked eyes with a cute girl. His confident voice said ‘go get her number!’ And he succeeds! Then his self-doubt leads him to backpedal so far back into a wall that the cute girl quickly makes her exit. Only the best of us can say we’ve socially failed as much. As with the first time I saw this performance, his lone astronaut in outer space scene lost me. The pacing of this particular scene felt slower, clunkier, and completely out of place with the rest of the show. I found myself quickly losing focus and then wondering how we ended up at this point before the scene ended and we continued where we left off previously. Monten’s story works entirely hand in hand with Jeremy Powell’s work in lighting and sound. The timing and execution of the dialogue paired incredibly well with the lighting cues and the audio. The Art of Being Alone had me laughing through the first time I saw it and it has done it again this time around. From before until now, the show is pretty much identical save for a few updated references in the script. In any case, it’s worth the watch. Content Warnings: Fog or Haze Effects, Mature Language, Sexual Content. Photo of Stephane Garneau-Monten provided by the company.